The scratchbook is a place where you can copy, paste, and edit commands without modifying the structure of the DVD. This menu is only fully active when you are in scratchbook mode (note – you can not enter scratchbook mode if trace mode is on). You may have as many scratchbooks as you like saved on your hard drive, each containing as many separate sections (groups of commands) as you wish. You may also designate a particular scratchbook as your default scratchbook. In addition, you may manipulate commands in the loaded scratchbook, either temporarily or permanently. Scratchbook files have the extension “sbk”. It is recommended that you associate these files with PgcEdit (see the Options → Install menu). Open Scratchbook and Save Scratchbook: Allows you to open/save the contents of a scratchbook to/from an sbk file on your hard drive. Append scratchbook appends the contents of a scratchbook on your hard drive to the scratchbook in memory as new sections (labelled loaded_scratchbook). Clear scratchbook clears all sections of the currently loaded scratchbook while Open Default scratchbook (Ctrl + z) closes the current scratchbook and reloads the default scratchbook from the hard drive (note that this is not an “undo” edits key). Save as Default scratchbook saves the commands in your current scratchbook as the default scratchbook, overwriting the current default scratchbook, if any. The default scratchbook is named pgcedit.scratchbook.sbk and is contained in %appdata%/PgcEdit. – Add new commands section (New Section button or Enter key) adds a new section to the scratchbook. You have the option to give the section user defined name. Note that certain special characters, including spaces, are not allowed in a section name (use underscore instead). – Rename selected section (Edit Cmd button) enables you to rename a section (same naming rules apply as above). – Duplicate selected section (Duplicate button) will duplicate the whole section of the current scratchbook. You will be asked to enter a name for the new section. – Cut commands and delete section (Cut button) is the same as delete but the commands (and not the label) are preserved on the clipboard for pasting back later either into a remaining section or a loaded DVD. – Copy current section commands (Copy button) copies all the commands of the highlighted section to the clipboard for pasting into any section of the scratchbook or a loaded DVD. It is the same as highlighting all the commands in the section and clicking Copy. – Append section commands to clip (Append button) appends all the commands of the highlighted section to those commands already on the clipboard for pasting later. This is a very useful way of combining the commands of 2 or more scratchbook sections. – Moving sections: Use these 4 functions to re-arrange the sections in the current scratchbook. If you move a section to the top and the original first section is “unnamed” (i.e. it is *****scratchbook commands), you will be asked to give a name to the original first section. 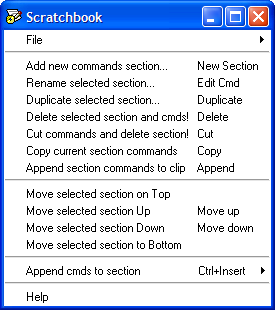 In all other respects, editing commands in any section of the scratchbook may be achieved by using the same buttons as if you were editing the commands in the main PgcEdit GUI on a loaded DVD (e.g. highlight a line and click Delete to delete it, Duplicate to duplicate it, Edit Cmd to edit it, etc). · Append cmds to section (Ctrl + Insert) allows you to highlight several commands in a section and add them to the bottom of any section of the current scratchbook (or you may decide to add them to a new section). This is the same as Edit → Append to scratchbook.